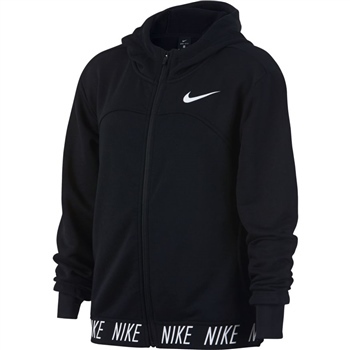 Nike Dry Girls' Full-Zip Training Hoodie provides versatile, lightweight coverage in a modern design perfect for changing weather. A multi-panel hood adds coverage to keep you warm and cozy wherever you practice or play. Mesh-lined pockets provide a soft, warm place for your hands. Multi-panel hood adds extra coverage. Paneled design moves naturally with you. Elastic hem printed with repeat "Nike" graphic adds modern detail.